A SPECIALLY-COMMISSIONED stamp has been unveiled by An Post to mark the golden anniversary of children’s charity Barnardos. The 55c postage stamp was launched by Communications Minister Pat Rabbitte and Fergus Finlay yesterday afternoon at the GPO. Finlay said the organisation feels “very honoured” that the Government and An Post has marked its contribution to Irish society “in such a wonderful way”. “We hope the stamp will spread a message of hope to all who see it and that it might prompt families in need to reach out for our help,” he added. An Post’s Donal Connell said the stamp will appear “all over the world” as it travels on cards, letters packages and takes its place in philatelic collections. Designed by Zinc Design, the 55 cent stamp features colourful elements from the paintings of young children attending some of Barnardos 42 project centres. Email “Barnardos gets its own stamp on 50th anniversary”. 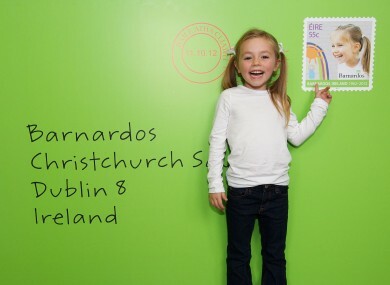 Feedback on “Barnardos gets its own stamp on 50th anniversary”.